Any material substance that can be consumed to supply heat or power. Included are petroleum (gasoline and diesel), coal, and natural gas (CNG, LPG), and other consumable materials, such as uranium, biomass, and hydrogen. A material used to create heat or power through chemical conversion in processes such as burning or electrochemistry. A combustible material used to produce energy. One of the essential factors in a Combustion engine (Fuel, Air, Proper proportion of mixture, compression, timing, spark). A chemical preparation which is added to fuel to improve and maintain its properties. Detergents and corrosion inhibitors are examples of gasoline additives. 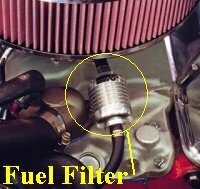 A combination of Vaporized fuel and air which is brought into the cylinder through the carburetor or fuel injectors. When it is compressed and ignited, it produces the power needed to drive the engine. A mist consisting of fuel and air that's compressed in the cylinders and ignited to drive the pistons in a car's engine. The amount of fuel in comparison with the amount of air. This is the reciprocal of the air-fuel ratio. Competition vehicle with an engine set up to burn alcohol, nitro, etc. mixture instead of standard pump gasoline. Also called fueller. A vented covering on the top of the tube leading to the fuel tank. Also called gas cap. A galvanic cell in which the oxidation of a fuel (e.g., methanol) is used to produce electricity. A cell that converts chemical energy directly into electric energy, with electric power being produced as part of a chemical reaction between the electrolyte and a fuel such as kerosene or industrial fuel gas. An electrochemical power plant (no moving parts) that creates electrical current from hydrogen and oxygen that is passed over a catalyst, usually a microscopically thin sheet of platinum. The electrical current is then fed directly to an electric motor for propulsion. Fuel cells differ from conventional electrical cells in that the active materials such as fuel and oxygen are not contained within the cell but are supplied from outside. It does not contain an intermediate heat cycle, as do most other electrical generation techniques. The only by product of a fuel cell's operation is water, which is pure enough to drink. These cells were first used by NASA in the 1960's for power generation in space capsules. The high price of fuel cell technology has limited the growth of their implementation, but now cells are being used to generate power in hospitals, and to propel vehicles. A device which continuously displays the amount of fuel used over the distance since last set. The amount of fuel used, expressed in miles per gallon in Britain and the USA, whereas the international measure is litres per 100 kilometres. The US term is fuel mileage. Device designed to regulate the fuel supply to the controlled equipment. These may be manual, semi-automatic or automatic. A control device which manually or automatically turns off the flow of fuel. The entire set of sequential processes or stages involved in the utilization of fuel, including extraction in its native form, transformation (converting it to a useful product), transportation to market, and combustion (i.e., consuming it at its final destination). Emissions generally occur at each stage of the fuel cycle. A device constituting the mixture control unit together with the airflow sensor. The number of litres used per 100 kilometres of driving (a lower number is better); or the number of miles driven divided by the number of gallons used (a higher number is better). (C2H5OH) An anhydrous alcohol (ethanol with less than 1% water) intended for gasoline blending as described in the Oxygenates definition. A piece of rubber about 4' square and very thin, which is located behind the filler door. When the door is opened, the flap falls down to protect the body from the fuel nozzle. A device that removes impurities (dirt and water) from the fuel before it gets to the carburetor or injection system. Filters may be made of metal or plastic screen, paper, or gauze. They are usually found near the carburetor in the fuel line that comes from the fuel pump (in-line fuel filter), or inside the carburetor (integral fuel filter) or within the fuel pump or fuel tank. These units must be cleaned or replaced on a regular basis, usually once a year or they will become clogged and restrict fuel to the carburetor. Without a filter, the jets and orifices in the carburetor will become clogged. A pump or machine for reducing the volume and increasing the pressure of fuel gas. An instrument, usually located on the dashboard or center console, which indicates the amount of fuel in the fuel tank. Most gauges have a Needle which fluctuates between E (empty) and F (full). Others show a digital readout of how many gallons or litres left in the tank. Also called gas gauge. Colloquial term for a fuel-injected vehicle. A gasoline engine with a fuel injection system rather than a carburetor. (FI) A fuel system that uses no carburetor but sprays fuel either directly into the cylinders or into the intake manifold just ahead of the cylinders. It uses an electronic sensing device to deliver the correct amount into the combustion chamber. Throttle-body injection locates the injector(s) centrally in the throttle-body housing, while Port injection allocates at least one injector for each cylinder near its Intake port. A pump on diesel engines that sends fuel to its mini-pumps, and from there to the fuel injector nozzles. A special nozzle which sprays the proper amount of gasoline or diesel fuel into the inlet ports, either directly into the combustion chamber or into a pre-chamber in response to signals from an electronic sensing device. The device that works like a hypodermic Needle to inject the proper amount of fuel into the combustion chamber in response to signals from an electronic sensing device on cars with fuel injection systems. It receive fuel at low pressure and shoot it into the engine cylinders at predetermined intervals under higher pressure. Also called fuel injector valve or just fuel injector. An instrument gauge that indicates how much fuel is in the fuel tank. The metal, plastic, or rubber hose or pipe through which the fuel passes from the fuel tank to the fuel pump to the carburetor or fuel injector nozzle. A motor detection device on a carburetor which closes or opens a fuel-metering port to regulate fuel mixture, keeping the air-fuel ratio at exactly 14.61 (stoichiometric) at all times. A measurement or calculation of the number of miles per amount of fuel -- usually measured in miles per gallon. A mixture of gasoline and air. An average mixture, by weight, would contain 16 parts of air to one part of gasoline. Kerosene or any hydrocarbon oil as specified by U.S. Department of Commerce Commercial Standard CS1 2 or ASTM D296, or the Canadian Government Specification Board, 3-GP-28, and having a flash point not less than 38°C. A liquid petroleum product less volatile than gasoline, used as an energy source. Fuel oil includes distillate fuel oil (No. 1, No. 2, and No. 4), and residual fuel oil (No. 5 and No. 6). The heavy distillates from the oil refining process; used as fuel for power stations and marine boilers. No. 1 diesel fuel: A light distillate fuel oil that has a distillation temperature of 288°C at the 90-percent recovery point and meets the specifications defined in ASTM Specification D 975. It is used in high speed diesel engines generally operated under frequent speed and load changes, such as those in city buses and similar vehicles. See No. 1 distillate below. No. 1 distillate: A light petroleum distillate that can be used as either a diesel fuel: (see No. 1 diesel fuel above) or a fuel oil: (see No. 1 fuel oil: (below). No. 1 fuel oil: A light distillate fuel oil that has distillation temperatures of 204°C at the 10-percent recovery point and 288°C at the 90-percent recovery point and meets the specifications defined in ASTM Specification D 396. It is used primarily as fuel for portable outdoor stoves and portable outdoor heaters. See No. 1 Distillate above. No. 2 diesel fuel: A distillate fuel oil that has a distillation temperature of 338°C at the 90-percent recovery point and meets the specifications defined in ASTM Specification D 975. It is used in high-speed diesel engines that are generally operated under uniform speed and load conditions, such as those in railroad locomotives, trucks, and automobiles. See No. 2 Distillate below. No. 2 distillate: A petroleum distillate that can be used as either a diesel fuel: (see No. 2 diesel fuel above) or a fuel oil: (see No. 2 fuel oil below). No. 2 fuel oil: (heating oil) A distillate fuel oil that has a distillation temperature of 338°C at the 90-percent recovery point and meets the specifications defined in ASTM Specification D 396. It is used in atomizing type burners for domestic heating or for moderate capacity commercial/industrial burner units. See No. 2 Distillate above. No. 2 fuel oil and No. 2 diesel sold to consumers for all other end uses: Those consumers who purchase fuel oil or diesel fuel for their own use including: commercial/institutional buildings: (including apartment buildings), manufacturing and nonmanufacturing establishments, farms: (including farm houses), motor vehicles, commercial or private boats, military, governments, electric utilities, railroads, construction, logging or any other nonresidential end-use purpose. No. 2 fuel oil sold to private homes for heating: Private household customers who purchase fuel oil for the specific purpose of heating their home, water heating, cooking, etc., excluding farm houses, farming and apartment buildings. No. 4 fuel oil: A distillate fuel oil made by blending distillate fuel oil and residual fuel oil stocks. It conforms with ASTM Specification D 396 or Federal Specification VV-F-815C and is used extensively in industrial plants and in commercial burner installations that are not equipped with preheating facilities. It also includes No. 4 diesel fuel used for low- and medium-speed diesel engines and conforms to ASTM Specification D 975. No. 5 and no. 6 fuel oil sold directly to the ultimate consumer: Includes ships, mines, smelters, manufacturing plants, electric utilities, drilling, railroad. No. 5 and no. 6 fuel oil sold to refiners or other dealers who will resale the product: Includes all volumes of No. 5 and No. 6 fuel oil purchased by a trade or business with the intent of reselling the product to the ultimate consumers. 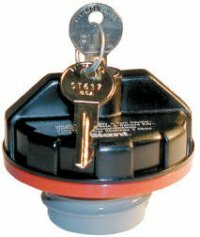 An on-off valve located at the bottom of a motorcycle fuel tank. It may have a filter screen and sediment bowl and sometimes provides a reserve fuel supply. A spring-loaded pressure-activated diaphragm valve that maintains the pressure in a fuel system to a pre-set value above manifold pressure, particularly in a fuel injection system and meters unused fuel back to the fuel tank. A vacuum device, operated either mechanically or electrically, that is used to draw gasoline from the tank and sends it into the carburetor or fuel injector nozzles. Mechanical pumps have a Rocker arm that is activated by a cam on the camshaft; the arm causes a diaphragm to move up and down, thus pulling the gas through the pump. Some electrical pumps have a rocker arm which is activated electrically and does the same thing as the mechanical pump. Other electrical pumps are located at the bottom of the fuel tank and push the fuel through the fuel lines. A filter screen built into the fuel pump itself as used on VW Beetles with a mechanical fuel pump. An electric switch which activates the fuel pump when the engine is cranked and when the engine is running. A hollow pipe that supplies fuel to the set of fuel injectors connected to it. A chemical which is added to gasoline to prevent it from becoming stale. Gasoline, diesel, or heating fuel reacts with oxygen in the atmosphere and leave behind a varnish-like film or gum residue. While some fuel contains an oxidation inhibitor which allows it to be stored for up to three months, other fuels don't have this inhibitor. Stale gasoline can clog fuel lines, carburetors, and injectors. A good fuel stabilizer can lengthen fuel's useful life. The failure of the fuel system to supply sufficient fuel to allow the engine to run properly, due to a blockage or vapor lock or malfunction of the fuel pump. A system that stores, cleans, and delivers the fuel to the engine in proper quantities to meet the varying needs that arise as you drive. It is made up of the fuel tank, fuel lines, fuel pump, fuel filter, and carburetor or the fuel injection system. The storage compartment, under the trunk in most cars, that holds the fuel for the vehicle. Also called the gas tank. A level sensor in the gas tank which sends information about the amount of remaining fuel. A pump that transfers fuel from the tank to the engine. An OBD term referring to feedback adjustments to the base fuel schedule. In fuel cells, the fraction of the fuel or oxidant that enters the cell that reacts electrochemically. Unintended leaks of gas from the processing, transmission, and/or transportation of fossil fuels. The support (often wedge-shaped) on which a lever pivots in raising an object. One of two rings on either side of a Clutch diaphragm spring on which it pivots. Annealing a ferrous alloy by austenitizing and then cooling slowly through the transformation range. A screw or bolt where the shoulder diameter is the same as the outside or major diameter of the threaded portion. A term expressing top speed or full throttle. A colloquial term used by vehicle salesmen to express the sale of a vehicle for the full sticker price with no discount. A condition of retreading where new tread rubber is added to the buffed Casing, and covers the crown and shoulder areas. An insurance coverage that includes liability, collision and a comprehensive insurance policy. Here is an informative guide. A special recycling machine grinds up the roadway, up to 6-10' deep, and produces a recycled granular base layer, usually incorporating a liquid asphalt emulsion binder. This layer is then paved with one or more layers of asphalt concrete. The finished driving surface could be an asphalt concrete 'top mix' or a surface treatment. Since this type of work involves up to three or four layers that often require 'curing,' it is usually spread over an 8-12 week period. A motorcycle helmet which covers the whole head including the chin. A rear drive axle that does not hold the wheel on nor does it hold the wheel in line or support any weight. It merely drives the wheel. Used primarily on racing cars and trucks. An Oil filter that filters all of the oil passing through the engine before it reaches the bearings. An engine that is fully modified and equipped for all-out performance. Maximum torque delivered without overheating. A condition in which a detachable component (e.g., seat belt buckles) is securely attached. The body of a bolt or screw which has a diameter between the minimum and maximum limits of the major diameter of the thread. The largest type of car according to the American system. It is a designation no longer used because even full-size cars are now about the size of what was the compact car. In 1970, for instance, a Chevrolet Impala was a full-size car, a Chevelle was an intermediate, and a Nova was a compact. When cars smaller than the Nova came out (i.e., Chevette), they were called sub-compacts. The full sun condition is the amount of power density received at the surface of the earth at noon on a clear day -- about 1.0 kilowatt/square-metre. Lower levels of sunlight are often expressed as 0.5 sun or 0.1 sun. A figure of 0.5 sun means that the power density of the sunlight is one-half of that of a full sun. A transmission system on a four-wheeled vehicle in which all four wheels are driven by the engine all the time. Other four-wheel drive units are normally in two-wheel drive mode with four-wheel drive selected by a separate lever when required. A condition where all four wheels are always being driven by the drivetrain. It may include the option of part-time (that is, shifting into 2WD for dry pavement) operation, and may or may not have Hi and Lo 4WD speed ranges. The British term is permanent four-wheel drive. A trailer with axles in the front as well as the rear. It can stand without support. Full trailers are coupled to straight trucks and to the rear of semi or full trailers by a tongue or drawbar. Full trailers are seldom used alone with tractors. A shipment comprising a full or almost full load on a truck. A full or almost full load is considered to be 39,000 to 44,000 pounds. A rectifier that converts ac to dc by inverting the negative portion of an ac sine wave. A live rear axle assembly in which the axle shafts serve only to transmit torque to the wheel. The total vehicle weight and cornering loads are transferred directly from the wheel bearings to the axle housing. A vent from which gas or steam issue; a geyser or spring that emits gases. Capable of working even if it is not working to its peak performance. A smokestack of a vessel. A car equipped with a powerful engine, used for drag racing. Usually has special body (such as Fibreglass) mounted on special lightweight frame and Suspension system. To bend by heating in furnace. Self-contained appliance designed to supply heated air through ducts to spaces remote from or adjacent to the appliance location. A protective electrical device (usually enclosed in glass or plastic) which has a thin wire between two terminals. The wire will break or melt when the current draw exceeds the capacity of the fuse. In this way, the circuit is protected from overload. The action of melting when a piece of metal turns to a liquid state and sometimes unites itself to a nearby component. A failure of an electrical component because of a blown fuse. A wire in the electrical system which outwardly may appear to be no different from other wires, but has a low resistance level so that when the current is above a certain level, the wire melts and breaks continuity. Plug or fitting made with a metal of a known low-melting temperature. Used as safety device to release pressures in case of fire. Two metals reaching the melting point and flowing or welding themselves together. The Adjustable Retention System extending behind a Bell bicycle helmets to allow the helmet to grip your head better.